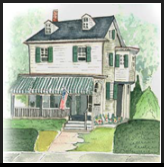 Thank you for choosing the Longfellow Guest House for your Cape May stay. We created this secure page so you can easily and securely pay via credit card. The details of your stay are spelled out in the lease documents that we've sent to the lessee via email/ PDF attachment. Add the separate Security Deposit to your order now, or you can wait until about a month before your rental, to pay. We look forward to having you at our guest house in June.